SEATTLE (UPI) — U.S. scientists have determined sipuleucel-T, a prostate cancer immunotherapy drug, significantly prolongs survival in men with advanced prostate cancer. A Phase 3 trial showed sipuleucel-T (Provenge) improved survival in men with metastatic disease. The Seattle-based Dendreon Corp., manufacturer of the drug, said compared with placebo, sipuleucel-T extended median survival by 4.1 months and improved three-year survival by 38 percent. The researchers said Sipuleucel-T successfully exceeded the pre-specified level of statistical significance defined by the study’s design and reduced the overall risk of death by 22.5 percent, as compared with placebo. More than 500 patients took part in the multi-center, randomized, double-blind, placebo-controlled study. Sipuleucel-T is an investigational therapy for men with androgen-independent prostate cancer. It is an active cellular immunotherapy designed to use live human cells to boost a patient’s immune system to elicit a long-lasting response against cancer. The trial’s results were presented last week in Chicago during the American Urological Association’s annual scientific meeting. CORVALLIS, Ore. (UPI) — U.S. scientists say they have discovered a genetic regulator that might help lead physicians to an earlier diagnosis of head and neck cancers. Pharmacy researchers at Oregon State University said the genetic regulator is expressed at higher levels in the most aggressive types of head and neck cancers and might even offer a new therapy at some point in the future. The “transcriptional regulator” is called CTIP2, and in recent research it’s been demonstrated to be a master regulator that has important roles in many biological functions. But in the study, scientists found for the first time that levels of CTIP2 were more than five times higher in the “poorly differentiated” tumor cells that cause the most deadly types of squamous cell carcinomas in the larynx, throat, tongue and other parts of the head. They discovered a high correlation between greater CTIP2 expression and the aggressive nature of the cancer. most often in the spine and long bones. bone to observe those interactions. are attracted to bone sites. particularly on the hormone androgen. 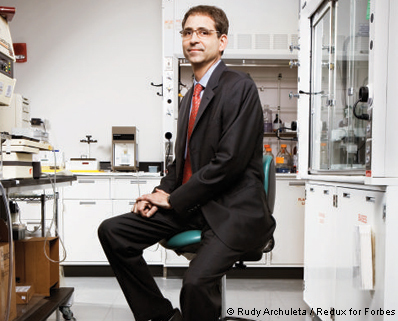 Novartis’ David Epstein is testing a new cancer drug in all sorts of different tumors. Novartis has ambitious plans for its new kidney cancer drug. Novartis hit a $3.7 billion (annual sales) home run with its leukemia drug Gleevec, launched in 2001. Now it hopes Afinitor will be its next cancer bestseller, says David Epstein, who leads Novartis’ cancer drug business. It was approved in March for patients with advanced kidney cancer who failed other treatments. Afinitor will share the kidney cancer market with three other new drugs, including Pfizer’s Sutent. But Novartis ( NVS – news – people ) has bigger plans for this drug. In an unusual move, it plans to test Afinitor simultaneously on five other tumor types, including stomach, breast and neuroendocrine tumors (the type Apple ( AAPL – news – people )’s Steve Jobs has suffered from). The eight trials–some under way and others scheduled to start later this year–will involve 5,000 patients in 35 countries. It’s a risky business move for Novartis, too. The drug’s science is obscure. Racing against Novartis are such competitors as Merck ( MRK – news – people ) and Wyeth ( WYE – news – people ). A cancer drug that delays progression by a few months can be a big moneymaker, especially if it has fewer side effects than the classic cancer drugs that attack all cells, cancerous and normal. Prices can be $50,000 per year or more for new cancer drugs. Afinitor costs $5,500 per month. Roche ( RHHBY.PK – news – people )’s Avastin, which starves tumors of their blood supply, has sales of $4.8 billion. Yet it extends survival in colon and lung cancers by just a few months; in breast cancer it slows disease progression without clearly extending survival. Novartis hopes it can pull off something similar with Afinitor, if on a smaller scale. “This will be an important drug,” swears Novartis Chief Executive Daniel Vasella. Doing so many trials at once is a big bet, he says, but it is a rational bet, given the promising early results. One encouraging area for Afinitor is stomach cancer, which afflicts 21,000 patients in the U.S. (and is more prevalent in Asia, where salty foods are common). In a 54-patient trial in Japan, Afinitor temporarily halted tumor growth in 55% of patients, according to results presented at a meeting of cancer specialists in January. Earlier trials are under way in breast, lung, prostate and endometrial cancers. Afinitor, Torisel and other MTOR drugs are the product of a four-decade research odyssey. They are chemical variants of an antibiotic called rapamycin, which Wyeth researchers found in soil samples from Easter Island in the Pacific Ocean in the late 1960s. Wyeth scientists originally hoped rapamycin could become an antifungal drug. Then they found that rapamycin suppresses the immune system. It was approved for treating kidney-transplant patients in 1999. Researchers noticed early on that rapamycin slowed the growth of cancer cells in the test tube. But the mechanism was totally unclear. A clue came in the mid-1990s, when Sabatini, as well as biologist Robert Abraham (then at the Mayo Clinic and now at Wyeth) and Harvard researchers, showed that rapamycin worked by binding and disrupting a chain of 2,500 amino acids called MTOR. Over the next few years researchers discovered that this protein is a growth regulator in organisms from fruit flies to humans. “Before it divides, a cell has to grow large enough and duplicate all its machinery,” says University of Cincinnati cancer researcher George Thomas. In 2001 researchers at Columbia University and ucla showed in mouse experiments that MTOR drugs compensated for the loss of a protein mutated in prostate and brain cancers. In 2004 scientists at Johns Hopkins discovered that a second protein linked to MTOR is frequently mutated in colon, stomach and brain tumors. Drug companies think they may discover more uses for MTOR blockers by combining them with other drugs. Several small trials hint that Afinitor may help restore the effects of Roche’s breast cancer drug Herceptin in tumors that have become resistant to it. Emory University oncologist Ruth O’Regan, who did one of the trials, calls the results “very impressive” and uncommon in advanced cases. Some researchers are disappointed that the results aren’t better. In many cases MTOR drugs don’t shrink tumors much but merely blunt their growth. Wyeth’s Torisel didn’t help small-cell lung cancer patients in a 2007 trial. Researchers at Wyeth and elsewhere are working on second-generation versions of the drugs, which more directly block MTOR and could be more potent. Novartis’ Afinitor (in orange) is one of a new class of drugs that turn down the volume on a crucial growth-promoting protein called MTOR (blue). MTOR receives growth signals and tells cells to grow when sufficient nutrients are present. Most cancers activate it. The drugs block MTOR by forming a complex with another protein, FKBP12 (white). Will this be enough to stop cancer? Trials will tell. Chicago – Every year, drug companies big and small make their way to the annual meeting of the American College of Clinical Oncology, a showplace for new cancer medicines. The data presented at ASCO can have a huge impact both on the share prices of drug firms and on the long-term sales of their medicines. Here’s a roundup of the most important drug studies from the meeting and a look at how they will affect the companies involved. (see “Novartis Steals The Show”). Sutent. The drug would compete with Nexavar, from Onyx Pharmaceuticals (nasdaq: ONXX – news – people ) and Bayer (nyse: BAY – news – people ), and Torisel, from Wyeth (nyse: WYE – news – people ), but could benefit from a clinical trial designed that tested it specifically as an option in Sutent failures. The other drugs are approved as first choices, and compete with Sutent, which has the lion’s share. Novartis shares are up 2.3% to $53.50. Novartis has 13 cancer drugs in development, more than any company but Pfizer, AstraZeneca (nyse: AZN – news – people ) and Genentech (nyse: DNA – news – people ). It expects to soon rank second in oncology sales after Genentech. ImClone and its partners, Bristol-Myers Squibb (nyse: BMY – news – people ) and Merck (nyse: MRK – news – people ) KgAA disclosed last September that its Erbitux had extended survival in patients with non-small cell lung cancer in a clinical trial. But the final results–a five-week extension of life for the average patient–were barely statistically significant. That will allow ImClone and its partners to grab sales in the lung cancer market, especially in those patients who can’t take Avastin. But it may not make up another result: clear proof that a gene test can help predict whether Erbitux is going to help colon cancer patients. Patients with a mutant version of a gene called KRAS comprise 40% of the people getting Erbitux, and they’ve been getting no benefit at all. As Forbes reported two weeks ago, this could lead to a sales slump. ImClone shares dropped 6% in early morning trading to $40. Genentech’s Avastin won’t face as much competition as many feared from ImClone’s Erbitux in non-small cell lung cancer, but new data also supported Avastin’s use in breast cancer. Shares are up 3.4% to $73. On Saturday, Infinity announced it was skipping mid-stage trials and going directly from early-stage safety and efficacy tests into a study designed to get its IPI-504 approved as a treatment for patients with stomach tumors who are no longer being helped by Novartis’ Gleevec or Pfizer’s Sutent. It’s a small market, but it could result in a speedy approval. Sunday Exelixis also said it is jumping directly into an approval trial, known as a Phase III study, from very early stage tests of its cancer drug XL184 in medullary thyroid cancer. It will be the first of Exelixis’ drugs to enter phase III. Fifty-three percent of patients taking the drug saw their tumors shrink. Infinity shares jumped 11% to $8.13, and Exelixis shares slipped 2% to $6.20. Avant is developing an immunotherapy, or cancer vaccine, for brain tumors with Pfizer. The vaccine is targeted against a mutated protein that only occurs in brain cancer cells. In a phase II trial, the average patient with glioblastoma who received the therapy, known as CDX-110, lived 33 months, twice as long as expected. Avant shares are up 36% to $19.20. PHILADELPHIA (UPI) — U.S. and British scientists say they’ve identified a class of drugs that may enhance the effectiveness of medications used to treat chronic myeloid leukemia. People with chronic myeloid leukemia are usually first treated with a drug known as imatinib mesylate. Although very effective at first, the body often becomes resistant to the drug as the disease progresses. Now a team of researchers from Britain’s University of Leicester and Thomas Jefferson University in Philadelphia has identified a class of drugs that might enhance the therapeutic effects of imatinib mesylate and other drugs that target the same molecule. Researches, led by Paolo Salomoni and Bruno Calabretta, observed that in several different CML cell lines and primary cells, although imatinib mesylate killed the majority of cells, a marked proportion underwent a process known as autophagy, destroying themselves. The scientists determined suppression of autophagy by using either drugs or RNA interference enhanced imatinib mesylate and also induced death of CML cell lines. The researchers suggest inhibitors of autophagy might be used with imatinib mesylate or other drugs that target the same molecule to enhance their therapeutic benefits. The study appeared in the Journal of Clinical Investigations and is available online at https://www.the-jci.org/article.php?id=35660.